Don't get any preconceived ideas about the content of the new Altaria by it's title Unholy. It's a misnomer; there's no evil, mysterious or frightening heavy metal here. Actually, it's quite the opposite. 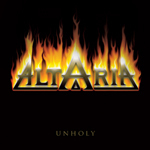 Switching from Metal Heaven to Escape Music this year as Altaria's Unholy has a greater flavor of melodic metal and hard rock for which the label is well known. In the past, Altaria has always been quite good at mixing strong melodies, ambitious vocal arrangements, and a catchy groove to its heavy metal. Unholy cranks this formula up more than a few notches. The greater majority of songs could easily pass for melodic hard rock, heavier yes, but quite melodic all the same. Songs like Pride & Desire, Never Wonder Why, Underdog, and especially Steal Your Thunder and Wind Beneath My Wings betray this characteristic. The latter two, Steal Your Thunder and Wind Beneath My Wings, develop the strongest rock and roll groove on the entire album. A song that blurs this distinction is Ready which can only be described as a heavy rock anthem with a well developed melody and hook (unlike much modern heavy rock). But don't dismay because the heavy metal is still here on Unholy. The formula of a catchy melody and big vocal arrangement blend with heavy metal on Alterior Motive, Unholy Invasion, and We Own The Fire. A truly sterling example of traditional melodic heavy metal at its story-telling best is found on The Lake, a satisfying and spooky tale set to music. The combination of these melodic hard rock and heavy metal elements give Altaria a huge boost in their musical journey. Their sound is nearing arena anthem sound, almost like a heavier Def Leppard without the pretentious over produced wall of sound. With Unholy, Finland's Altaria pushes their already robust melodic sound from heavy metal to hard rock. The metal is hardly forgotten, but it is refined with better melodies, huge vocal arrangements with catchy choruses, and a near arena rock sound. Very recommended! With Unholy, Finland's Altaria pushes their already robust melodic sound from heavy metal to hard rock. The metal is hardly forgotten, but it is refined with better melodies, huge vocal arrangements with catchy choruses, and a near arena rock sound.